Before Jim Harbaugh became an NFL head coach, he played for the Bears and Mike Ditka and helped a female reporter. 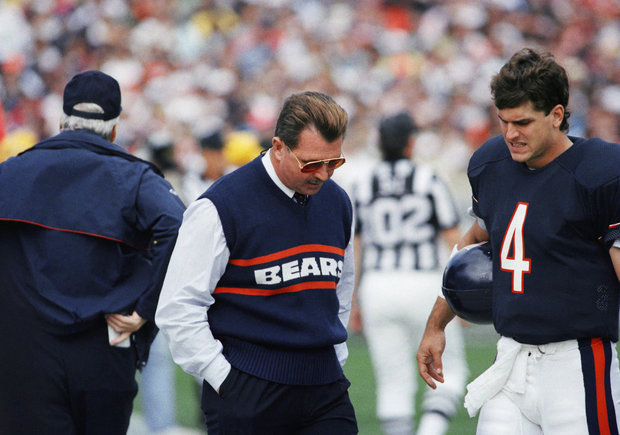 Former Bear Jim Harbaugh and Mike Ditka during his Chicago playing days. After decades of covering sports teams, players and coaches, you may have an opinion or feelings about someone not based on their accomplishments or the team they represent. But as a reporter you do your best to remain objective and neutral. As the hype for the Super Bowl builds to a fever pitch, there is someone that this reporter is rooting for - San Francisco head coach Jim Harbaugh. It is not because he was a former number one draft pick of the Bears. It is because of a simple act of kindness he showed me. Several years ago there were very few women covering sports teams in Chicago. Jeanne Morris for television, Linda Kaye for the Chicago Tribune and me for WMAQ radio. Neither Jeanne nor Linda were going into the teams&apos; locker rooms. Chicago locker rooms were a territory just beginning to open up to women reporters. I was beginning that obstacle alone and meeting some challenges along the way during the early to mid-&apos;80s. The Bears were a huge challenge. There was no interference after games when I started covering them at Soldier Field in 1985. I had entered the baseball and NBA locker rooms with some resistance, in previous years, but I learned football would be the more difficult. The problem happened during the practices the week before games. My role at the station changed and I was sent to cover the team during the week for their “open” locker room time. On Wednesdays and Thursdays the players were made available to talk to reporters before practice. This was the season following the Bears Super Bowl victory, which I did cover in New Orleans. During training camp I ventured to Platteville, Wis. to cover the Bears without any incidents. There were no locker room interviews; it was done on the field or during lunch. So when my News Director Tom Webb told me to go to Halas Hall I wasn’t concerned. I should have been. My only concerns during the drive up to Lake Forest were to think about the match-ups of the upcoming game and who would be a good subject to talk to get a good story. I was trying to fit in without any fanfare, without being noticed and without any trouble. The media relations person at Halas Hall announced that the locker room was open. There was a group of reporters, (very small compared to the numbers now) and I walked in the middle of the group. That is when I was greeted by angry, hurtful words and loud obnoxious screams. It was evident it was directed at me and the reporters all stepped away as I took the abuse. At that point, the Bears media person told me I had to leave and would not have access. I walked out the door unsure as to what had just happened. I controlled my anger as the realization set in. Remember the Bears were the darlings of the sports world, and I was an unwelcome intruder who had to figure out what to do next. No one wanted to come to my rescue. I had to find a different way of doing my job. From that point on, I would go up to Halas Hall and sit outside the locker room on the floor waiting for players to come talk to me. It singled me out, which was something I was trying to avoid. The problem for me was that the players had already talked with other reporters, and some didn’t want to do it again or perhaps they didn’t want to talk to a woman. There were no problems after games. As a reporter, you are part of a large group surrounding a player and you can go undetected even if you ask a question. The players are still in a zone from just getting off the field. So the routine became, cover the games and go to Halas Hall and sit on a floor and wait for players. He wasn&apos;t kidding. Jim had the firm look he shows now as San Francisco&apos;s coach. There was no answer that would be satisfactory to Harbaugh. There was more to the conversation, but for me, his first words were the most relevant. Until that point, no one else had even challenged or really cared about my situation. Jim and I talked, and we walked into the locker room. There were no angry voices, there were no insults. (Now there was no red carpet or rose petals thrown either.) At times there were some other incidents, but this was a huge change at Halas Hall. The funny thing, which Jim probably didn’t realize it at the time and may not remember now, is that years later when he went to play for the Indianapolis Colts, I wrote him a thank you note. He had said something that was important for any woman in sports. It was just a simple act of kindness that altered a really tough situation. Maybe it would have changed a different way or with a different person, but for me, it changed because of Jim. Next Sunday I will take off my reporter’s hat and become a fan and root for the Niners. All female sports reporters should too.